Greek containership owner Danaos slumped to a $366m loss in 2016 after a $117m profit the previous year. As a consequence of Hanjin charter terminations, Danaos was obliged to recognise a $205m impairment loss in its accounts, as well as a $210m write-down on 18 other ships in its fleet, reflecting dire market conditions, especially for panamax vessels. The New York Stock Exchange-listed shipowner operates 59 containerships of 2,200-13,100 teu, of which five 3,400 teu and three 10,100 teu vessels were on long-term charter to Hanjin, representing around a fifth of Danaos’s $2bn contracted revenue. Following the carrier’s bankruptcy, when the ships were eventually returned, Danaos managed to find short-term charters for all eight, but at considerably lower market rates. But he added that as a result of the decrease in operating income and charter ship values, Danaos was in breach of financial covenants attached to the ship mortgages. He said that while waivers had been obtained on mortgages that expired on 1 April, Danaos continued “to engage in discussions with our lenders to address the matter”. Although it had “ceased recognising revenue” from Hanjin last July, Danaos said, there had been an earlier accumulation of $15.8m in unpaid charter hire. The shipowner said it had submitted an unsecured claim of $598m to the Bankruptcy Court of Seoul to cover the unpaid charter hire and to compensate for the early termination of the charter party contracts. However, according to Alphaliner, unsecured creditors – also including banks, bondholders, shipowners and trade debtors – can expect to recover “close to zero” of their outstanding claims. Alphaliner said that although accounting firm Samil PwC had, in December estimated Hanjin’s liquidation value at around $1.53bn, reported asset sales so far had generated only $157m, which excludes the sale of vessels seized by creditors. Danaos’ business model is based on long-term, fixed-rate charter parties with ‘blue chip’ container shipping lines, but in 2013 it was caught up in Zim’s financial restructure after the Israeli carrier short-paid charter hire on six panamax ships, initially with a pledge to pay the differential when the market improved. 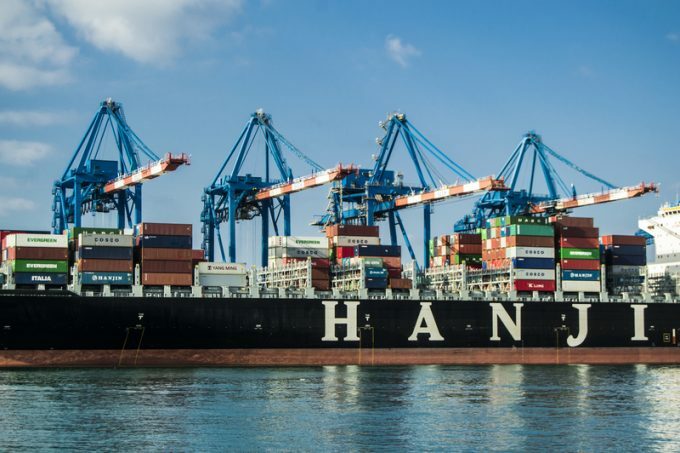 And in July last year it was forced to concede further charter hire rate cuts on 13 vessels on long-term fixed-rate charters to Hanjin’s smaller compatriot, Hyundai Merchant Marine (HMM). As part of HMM’s restructure Danaos agreed to a three-and-a-half year, 20% reduction in charter hire payments. In notes to the 2016 accounts, Mr Coustas said “very few” long-term charters were being achieved in the market and that he did not expect rates to “meaningfully improve for another 18-24 months”.